Russel is gay. He assumes he is the only gay person in the whole of Goodkind High School. That is until he meets another Goodkind student in an internet chat room. The other student just happens to be star baseball player Kevin and the pair hit it off, at night, in the stinky gazebo at the local park. They can’t tell anyone about their friendship, or relationship. The Russel finds out his best friend Min has been seeing her good friend Terese secretly, and together they form a club where they can be themselves, enjoy each other’s company and talk about being gay. The club is Geography club, and with a name like that no one is ever going to want to join, right? I was approached by the author of this book last year in the hope I could review it to coincide with the movie adaptation coming out in the States. Unfortunately that didn’t happen, I’m a little late to it, but I could kick myself for not picking it up sooner! This is a brilliant, funny, true interpretation of being gay in high school and I loved nearly every minute. The story is a typical high school coming of age tale, except that the protagonist is gay, as are many of his friends. This makes high school harder, it’s the truth no matter how sad it is. Teenagers are mean and they are meaner to anyone who doesn’t fit the mould. This story shows that in all it’s technicolor horridness and shows just how strong you have to be to survive. It is a story of first love and being true to yourself no matter where that gets you. It’s a story from the heart and I could seriously relate despite not being in high school in the US. The characters aren’t at their best in this book, you can tell some of them often don’t mean the things they say and aren’t mature enough yet to handle the things going on. They aren’t all ready to deal with their true selves but that’s what being that age is all about, learning and growing and thankfully we see some of them do that which is my favourite part of the book. Kevin had the most to lose and I understand exactly why things turned out how they did with him. Russel had a choice to make and never really knowing the easy option he chooses to take the harder one and I adored him for that. Min was easily the best character and I loved her from the start. She was very much together and clued up about everything but didn’t want to disappoint others, like her parents and Terese, by coming out. I liked her the most because she really did stand up for what she believed in. The book was adapted for the big screen last year and I am hoping to watch the film soon. Unfortunately having looked online it seems there are some major differences which may bug me but we’ll see. I think the book works so well because of the questions it raises and society, and what everyone’s so afraid of. The school are ridiculous in their handling of the health teacher and that bit was very important to me because it showed that the prejudice never really goes, you just have to stand up to those too narrow minded to relax and work out a way for it to be better. Homophobic people are idiots but don’t let them get you down, that’s what I say. Geography club is a brilliant LGBT YA coming of age story with important messages. It’s a brilliant read and I am definitely looking forward to the next book in the series. Considering the book is now ten years old it holds it’s age well and I honestly do think its worth a read by any teenager, no matter their sexual preference. 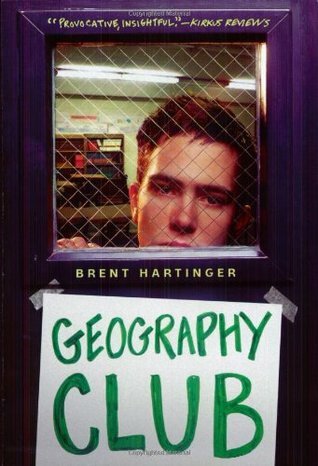 Geography Club was published in 2003 by HarperTeen. My copy was sent from the author in exchange for an honest review. Ooh I bought this a while back but never got round to it. Have to bump it back up the TBR now!